Cultural and archaeological tour specialist Peter Sommer Travels will introduce four new itineraries in 2012, offering extraordinary journeys among the historic sites and spectacular landscapes of the Mediterranean. Led by expert guides including archaeologists, historians and travel writers, the tours explore the great wonders of past civilisations while enjoying the food, culture and history of each region. The four new itineraries are among 19 different tours and gulet cruises offered in Turkey, Greece and Italy, catering for small groups of no more than 18 people. Showcased in the newly released Peter Sommer Travels 2012 brochure, they include 10 sailing itineraries aboard traditional wooden gulets, plying the azure waters of the Mediterranean between ancient sites and secluded coves while enjoying fine food served by a private on-board chef. Cruising to the Cyclades (May 19-June 2) – A quintessential Greek island experience, sailing clear blue waters to more than a dozen Aegean islands in the Dodecanese and Cyclades archipelagos. Led by archaeologist Heinrich Hall, the itinerary includes glorious Santorini, laid-back Kos and mountainous Naxos. Fifteen days, £3675* per person twin share (approx A$5549*). Cruising the Carian Coast (July 21-28) – A special family sailing led by archaeologist Peter Sommer, visiting Turkey's south-west coast where ancient sites are scattered among beautiful towns and spectacular coastline, with plenty of opportunity for families to enjoy swimming and walking. Eight days, £2175* per person twin share (approx A$3284*) or £2050* per child up to age 12 (approx A$3095*). Exploring Cappadocia (September 3-8) ­– An adventure among the remarkable geological formations and ancient cave dwellings of Cappadocia, hosted by historian Dr Michael Metcalfe and featuring an early morning balloon flight over Turkey's most celebrated landscape. Six days, £1375* per person twin share (approx A$2076*). 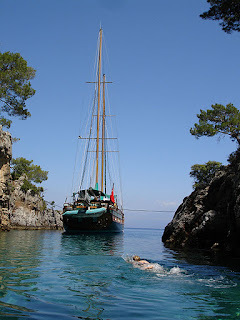 A Carian Odyssey (September 8-22) – a gulet cruise along the magnificent Carian coastline of Turkey led by archaeologist Heinrich Hall, visiting spectacular sites like the marbled harbour city of Knidos and the cliff-face tombs of Kaunos, with time to enjoy quiet coves, scenic walks and fine food. Fifteen days, £3425* per person twin share (approx A$5171*). Among popular itineraries returning in 2012 is Peter Sommer's signature tour In the Footsteps of Alexander the Great: the Conquest of Asia Minor, a 20-day journey through Turkey chosen by National Geographic Traveller magazine as one of the world's ten best educational holidays in 2008. A complimenting 20-day tour, In the Footsteps of Alexander the Great: from Boy to King, explores the ruler's early life in Greece through the ancient sites of Macedonia. *Tour prices include all meals and accommodation aboard gulets, road transfers, all crew and guide services, and all entrance fees and tips on excursions. Excludes airfares.